That's the current tagline for an initiative we're soft launching, with the aim of bringing together people (you?) curious about self-organised learning in commerce, community and education. How can you design and create your own learning experiences — or help your others to do so — and save money in the process? We don't have all the answers to that, but we know many learning initiatives of recent years have wasted a lot of money by being over-engineered and inflexible. We're interested in developing alternatives to this that are leaner, vastly more responsive to learner needs, and supported by more lightweight infrastructure. Have online tools and resources got sufficiently sophisticated that, with a bit of ingenuity, you could create a social learning experience that delivers what you and your friends, colleagues or associates want? We're not entirely sure how this Agile Learning group is going to work. The last thing we'd want to do is to over-specify it! We're anticipating some learning activities — online and offline — to pool experiences, resources, and generally accelerate our exploration of what makes this kind of approach work. But for now we're just floating the idea and inviting feedback from whoever's interested, in whatever format suits you. You may be thinking that this seems a bit abstract… Help us choose where to provide or develop concrete examples. If you've got experience of agile techniques or tools, I'd love to do an interview with you, to be written up on this blog and/or elsewhere online. Or, if you share a specific learning context and problem, I'll have a go at outlining what an agile learning solution might look like. If you can spare ten minutes, it would be immensely valuable if you could say a bit more about your particular interests by completing our survey. And/or just contribute ideas directly via this forum. 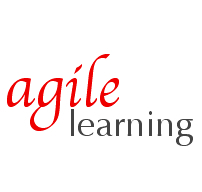 We've just started an Agile Learning Twitter account and Facebook page. We'll run these in parallel for a while, and possibly add a wiki and/or social network platform, before deciding whether to keep multiple channels going or focus down. In the meantime, please retweet, become a fan, share with your friends, and so on. In June I'll be convening some face-to-face meetings in London where we can review initial ideas and feedback and start self-organising the next phase of activity.